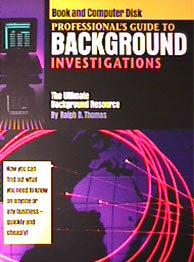 The Professionals Guide To Background Investigations is an amazing book and computer disk that you open in your web browser that gives you instruction to conducting a background check on anyone and provides you with links to a huge assortment of free searches on the internet. It also guides you to sources to use for fee based searches and links you to a huge assortment of other resources and aids on the Internet. The first section is a digital reference book that hands you expert know-how on how to go about conducting a background check on any person or company quickly, easily and cheaply. The second section hand you all the extremely hard to find free searches and pubic records on the internet you can run to conduct the background check. The third section gives you access to a wide assortment of other guides, resources and references on conducting background checks. Discover the different modes of access to information collected in a background investigation to determine which is the right way to do it for you. Obtain county, state and federal criminal records-the majority for free. 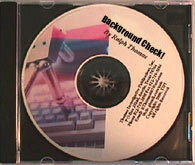 Develop the other background sources and techniques you will use to conduct a background check on any person of business quickly and easily.